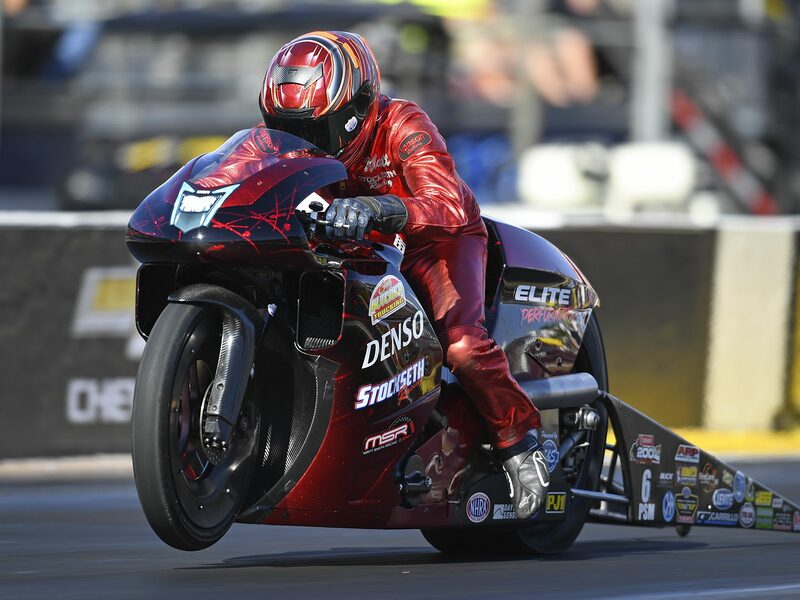 In Pro Stock Motorcycle, Smith rode to a track record speed at 200.65 at 6.774 to lead the field on his Elite Motorsports DENSO Auto Parts EBR at the 54th annual Auto Club NHRA Finals at Auto Club Raceway. Smith was the quickest in both qualifying sessions. Smith is the current category points leader and seeking to extend his lead. Pro Stock Motorcycle — 1. Matt Smith, EBR, 6.774, 200.65; 2. Hector Arana Jr, EBR, 6.824, 198.96; 3. LE Tonglet, Suzuki, 6.828, 196.39; 4. Jerry Savoie, Suzuki, 6.848, 194.74; 5. Eddie Krawiec, Harley-Davidson, 6.864, 197.77; 6. Joey Gladstone, Buell, 6.880, 196.30; 7. Chip Ellis, Harley-Davidson, 6.880, 194.80; 8. Hector Arana, EBR, 6.885, 197.57; 9. Scotty Pollacheck, Suzuki, 6.885, 194.49; 10. Andrew Hines, Harley-Davidson, 6.886, 194.60; 11. Ryan Oehler, Buell, 6.893, 196.64; 12. Angelle Sampey, Buell, 6.895, 193.40; 13. Steve Johnson, Suzuki, 6.898, 191.29; 14. Karen Stoffer, Suzuki, 6.952, 191.40; 15. Freddie Camarena, Suzuki, 6.953, 194.86; 16. Katie Sullivan, Suzuki, 6.978, 193.99. Not Qualified: 17. Kelly Clontz, 7.013, 191.57; 18. Anthony Vanetti, 7.074, 188.94; 19. Angie Smith, 7.081, 163.63; 20. Maurice Allen, 7.114, 186.64; 21.